On May 4, 2015, the Court of Appeal for Ontario upheld a decision of the Superior Court of Justice and dismissed an appeal in the case of King v. 1416088 Ontario Ltd. 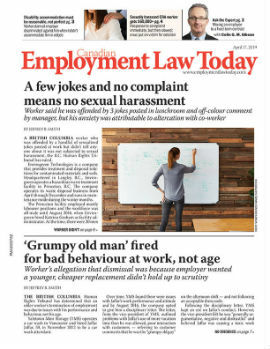 In King, the appeal court determined that where there is a sufficient relationship among companies, the companies are to be regarded as one for the purpose of liability for wrongful terminations. The court also found that these companies are jointly and severally liable for valid pension agreements regardless of which company executed the pension agreement. The fact that the companies did not execute the agreement does not relieve them of liability. Jack King was formally employed as an accountant by a series of Danbury corporations from September 1973 to October 2011, a period of 38 years. The Danbury group has carried on a liquidation and auctioneering business in Toronto for decades through various corporations. King entered into an agreement with the Danbury company that was his formal employer in 1981. Under the terms of this agreement, he was entitled to retirement compensation of $736.60 per month for life, so long as he continued to be employed with the company of its successors until he was 65 (the pension agreement). At the time his employment was terminated, King’s formal employer was Danbury Industrial. Two months later, Danbury Capital and/or DSL Commercial (DSL) held an auction and was operating a liquidation and auctioneering business using the Danbury name and premises. King had assisted with the “groundwork” necessary for DSL’s start-up prior to the end of his employment with the Danbury group. The president of Danbury Industrial (King’s formal employer at the time of termination) was David Ordon. The president of DSL was David’s son, Jonathon Ordon. All of the employees of Danbury Industrial save for David Ordon were terminated at the same time. David Ordon was later hired by DSL with five other former Danbury Industrial employees, but King was not. At the time of termination, King was nearly 73 years old and was given no compensation for the wrongful termination. King sued various Danbury corporations for which he had worked over his career. At trial, the judge found that all of the appellant companies were King’s common employer, and so were jointly and severally liable for the monies owed to King. The trial judge also found that the pension agreement was valid and that all of the appellant companies were liable for the benefits due under that agreement. On appeal, the Ontario Court of Appeal upheld the trial judge’s ruling. The court determined that there was a sufficient relationship among the appellant companies that they should be regarded as one, for the purpose of liability for the wrongful termination of King’s employment. The court also found that the trial judge also made clear findings of fact that supported his conclusion and demonstrated the interconnections among the Danbury businesses and King’s contributions to them all. His findings also made it clear that although DSL was owned by Johnathon Ordon and may not have formally started operating until after King’s employment was terminated, King did work for DSL prior to its formal launch. The court also held that once the trial judge found that the pension agreement was valid and King had provided essentially the same services throughout his 38 years of service, in light of his findings on the matter of common employer, it follows that the appellant companies were jointly and severally liable for the amounts owing under that agreement. Accordingly, the appeal was dismissed with costs to the respondent. This decision demonstrates where there is evidence of “common control” that multiple companies may be considered as a “common employer.” Companies with a sufficient relationship among them will also be regarded as jointly and severally liable for the amounts owing under their agreements. Employees should be aware of the “common employer” doctrine and how it can cause future companies to be liable for previously established agreements. In transition between companies, employees should determine whether their benefits and agreements will be honoured by the new employer, and should seek legal advice on the matter. · King v. 1416088 Ontario Ltd., 2015 CarswellOnt 6310 (Ont. C.A.). Ronald S. Minken is a senior lawyer and mediator at Minken Employment Lawyers, an employment law boutique, located in Markham, Ontario. He can be reached at www.MinkenEmploymentLawyers.ca. Ron gratefully acknowledges Sara Kauder and Kyle Burgis for their assistance in preparation of this article.